This script takes over the Nagios host e-mail notifications by receiving the Nagios host state information, formatting the e-mail according to various flags and sending it out through an SMTP gateway. 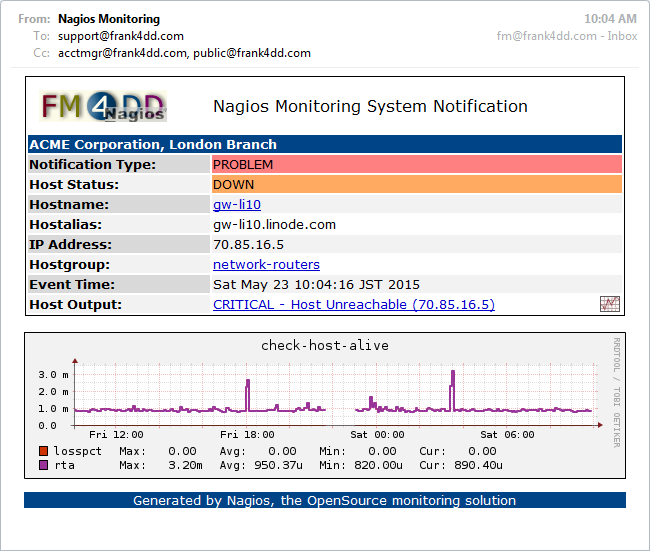 Nagios: Nagios-based monitoring system with Nagios environment macros enabled. This is usually done in [nagios_home]/etc/nagios.cfg. RRDs perl package; coming with rrdtool. Notification scripts since version 1.8.0 require rrdtool 1.4.x and above. A frequently asked question is about the dependency on the mail server Sendmail. There is no such dependency, this is only a unfortunate naming of the perl library Mail::Sendmail, which is providing e-mail related functions to the scripts. The scripts work fine with any mail server, including Postfix, Exim, or others. the prefered e-mail language. The content-type header is currently is hard-coded to UTF-8. This might need to be changed if recipients require a different characterset encoding. Below is an example of the notification definition in the Nagios command.cfg file. I typically move all notification commands into its own configuration file notifictions.cfg (example). Here, the -c "$CONTACTADDRESS1$" \ line is optional, and just demonstrating the ability to define cc: lists. The notification script with its most basic use, English language and plaintext notification. The same example notification using the -f HTML -u options, formatting the content as HTML with links to Nagios. The same example notification using the -f multi -u options, formatting as HTML with links to Nagios, and adding the logo image. Since version 1.4, it is able to pick up RRD perfomance data and include a on-the-fly generated graph image with the notification. This works with Nagiosgraph v0.9.1 and possibly also with later Nagiosgraph versions. If Nagiosgraph is not available, then it is best to use only the notification formats 'text', 'html' and 'multi'. From version 1.7, all improvements that went into the pnp4n scripts were backported into the Nagiosgraph scripts. This includes improved debugging, additional language support (French, German, English, Japanese), and other minor updates. Check access/execution rights: It is best to place the scripts in the Nagios plugin directory, and have them be owned by the Nagios user and group. Check mail sending: Confirm the mail settings and correct delivery, using a commandline tool, e.g. susie:~ # echo "Test message" | mailx -v -r "me@example.com" -s "Test"
Test the notification script: Running the Nagios notification script with the '-t' option creates a test e-mail, together with extra debug output into the mail, and console. Please edit the head of the scripts to set the mail return address and Nagios base URL. Particularly the scripts mail sender address. I get occasional notification e-mails from various companies for system or service problems, because the scripts still have my sender mail address. Language Support: Multi-language language support (French, German, English, Japanese) is implemented, and the definitions can be extended to support other languages as well. Color Coding: Below is the color code table for the notification type and host states. Color can be easily adjusted by setting the %NOTIFICATIONCOLOR values to a different RGB code. I added a '# nagios: -epn' directive on the scripts line 3 to explicitly disable the use of the embedded Perl interpreter. Using ther embedded Perl interpreter is dangoerous because of the easy introduction of memory leaks. Nagios v4.0.0-4.0.2 with Nagios BugID 0000498: In these affected versions, the Nagios environment variables are not exported, and as a result the data handover to the scripts does not work. 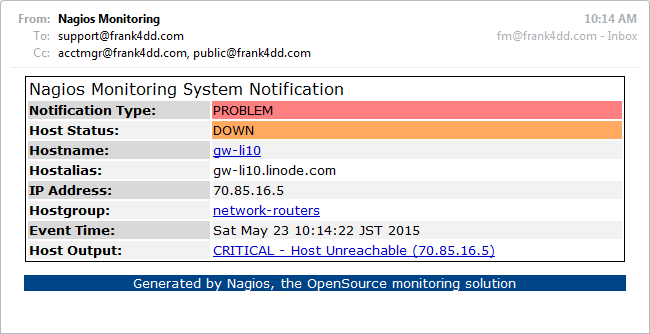 No notifications go out since no destination e-mail address comes from Nagios. 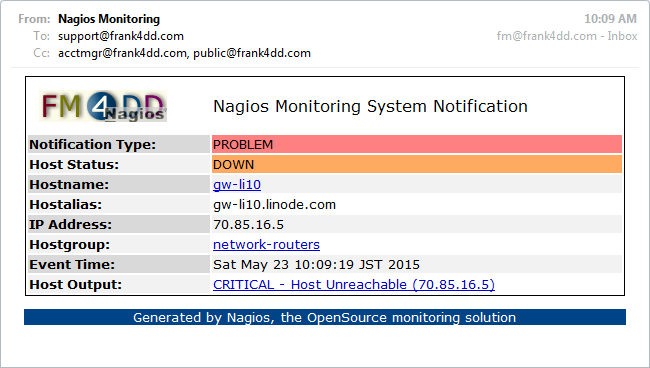 This problem is fixed from Nagios 4.0.3 and up. For an alternate download location, see also the corresponding github repository. Implementation Guide - Further information and implementation notes can be found under Flexible Notifications for Nagios. nagios_send_service_mail.pl - The Nagios monitoring script for services and Nagiosgraph can be found here: nagios_send_service_mail manual. pnp4n_send_service_mail.pl - The Nagios monitoring script for services with PNP4Nagios can be found here: pnp4n_send_service_mail manual.